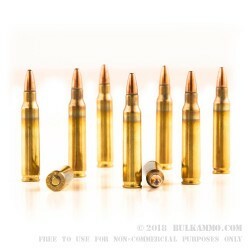 You’ve put too much care into your AR-15 to run an inferior ammunition through it. 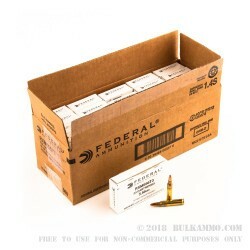 Treat that ArmaLite right with this premium cartridge from Federal’s Lake City Army Ammunition Plant. 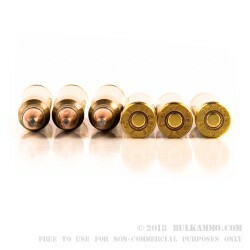 This round’s Boxer primed brass casing has a water resistant lacquer on its primer and mouth, and is both non-corrosive and reloadable. It’s further vetted to fire reliably at temperatures spanning from -40 to 125 °F. 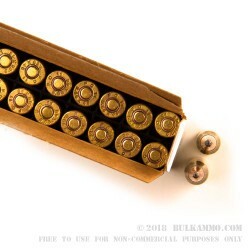 As such, its a cartridge you can depend on for target practice, varmint hunting, and tactical exercises alike. 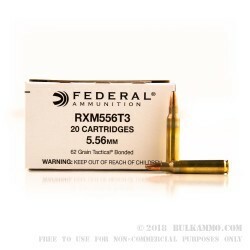 This 5.56x45mm cartridge’s bullet has a tactical bonded core, where its copper jacket is securely affixed to its soft point lead core to promote maximum weight retention and uniform expansion after impact, without sacrificing any accuracy. 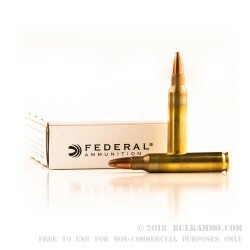 With a muzzle velocity of 2,900 fps, this round will deliver some serious damage. 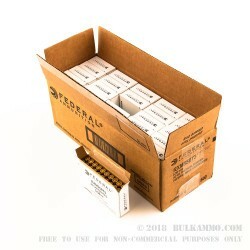 This cartridge contains no ferrous materials and will not attract a magnet.